The snow is already falling here in New England, and for me that means soup, soup, and the occasional pot of chowder. 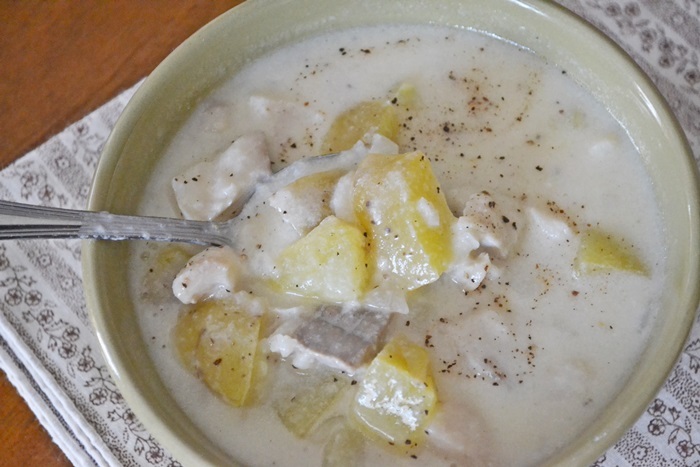 If you’re tired of clam chowder (heaven forbid) you may want to try a classic recipe for simple fish chowder instead. In 1961 a young fan wrote to President John F. Kennedy asking what he liked to eat, and a recipe for fish chowder was his reply. Chowder is, of course, a New England mainstay. 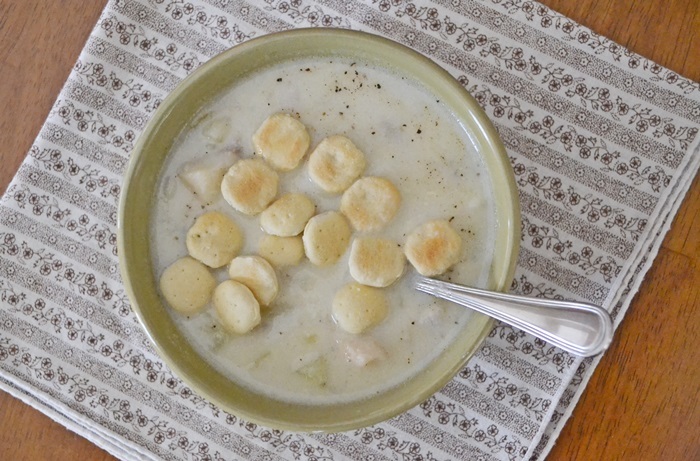 We tend to be most passionate about clam chowder, but fish, scallop, and even corn chowder are welcome on the Yankee supper table, provided they don’t contain a drop of red (as in the tomato found in other chowder recipes) and are served with a side of common cracker to crumble in as a thickening agent. Since it’s increasingly hard to get your hands on true common crackers these days, oyster crackers are an acceptable substitute. When making chowder you can go for maximum creaminess and use all cream, or you can back things off and use a combination of milk and cream or just milk. Potatoes are a must, celery is optional, and like most things (except in my kitchen), bacon or salt pork is encouraged. It doesn’t hurt that chowder tastes better after it’s had a chance to sit for a day or two, so if you make more than you can eat at once, fear not…you’ve just secured yourself a delicious few bowls for later. Heat the oil in a large Dutch oven over medium heat. Reduce the heat to medium-low and add the onion, celery (if using), salt, and pepper. Cook, stirring frequently, until onion is translucent and lightly browned. Add flour and stir to combine, then add the water or clam juice. Whisk until flour dissolves and mixture thickens, then add the potatoes and bay leaf. The liquid in the pot should just barely cover the potatoes. If not, add water until it does. Increase heat to medium and bring to a simmer, then cover and cook until potatoes are barely tender, 8-10 minutes. Reduce heat to low and add the fish and milk. Make sure the chowder stays at barely a simmer or the milk is likely to curdle (using cream instead of milk decreases the chance of curdling, but alas, increases the calorie content). Cook until the fish is just opaque, about ten minutes, then remove from heat and discard the bay leaf. If possible, allow the chowder to rest for at least 30 minutes, then season to taste with salt and pepper and top with butter, chopped chives, crumbled bacon, or common crackers.